For 16 years, through Olympics in Sydney, Athens, Beijing, London and Rio, African-Americans swam under a microscope for their country. Questions about oddity and identity weighed them down as they tried to outrace history and the competition. 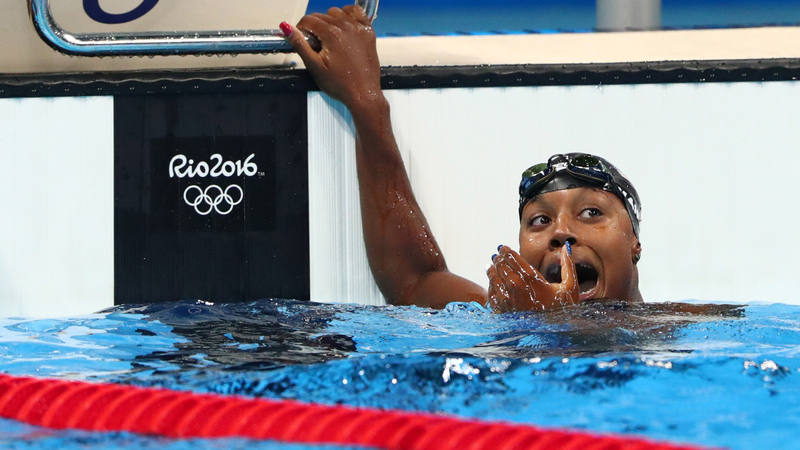 Finally, on Thursday night, Simone Manuel’s gold medal in the 100-meter freestyle turned a liberating page for black swimmers. Trailing by an ominous half-second at the turn, Manuel used a furious closing charge to finish tied with Penny Oleksiak of Canada in an Olympic and American record of 52.70. Manuel is the first African-American woman to win an individual swimming medal at any Olympic Games. After shedding tears on the medal stand while the national anthem played, Manuel thanked black predecessors like Cullen Jones and Maritza Correia in acknowledging the historic nature of her victory. Achilles had a heel, Usain Bolt have a hamstring? Decades after the end of Jim Crow laws that kept black folks out of white pools, African-Americans still have a complicated relationship with swimming. If a parent can’t swim, there’s only a 13 percent chance their child will learn, according to a 2010 report commissioned by USA Swimming. The report found that 69 percent of black children and 58 percent of Latino children cannot swim, compared with 42 percent of white children. Black children drown at a rate almost three times higher than white children. Rio is the first Olympics where the U.S. swim team has two black women — Manuel and her close friend Lia Neal, who won a silver medal in the 4×100 freestyle relay. Manuel and Neal fielded so many “black swimmer” questions leading up to their races, it threatened to slow them down in the pool. “That’s something I definitely struggled with a lot,” Manuel said. “Just coming into this race tonight I kind of tried to take the weight of the black community off my shoulders, which is something I carry with me. Manuel’s father, Marc Manuel, played basketball at the historically black Xavier University in New Orleans, and works in information technology. Her mother, Sharron, is a pharmacist. Simone started swimming at age 4 because her parents wanted her to be safe in the water. She almost chose to pursue ballet before choosing swimming. In Rio, coiled in her stance to begin the final, Manuel seemed to flinch just before the gun and did not get a great start. At the turn, she trailed by .47 seconds — the basketball equivalent of a 15-point halftime deficit. But Manuel started to close over the last 25 meters, and with 15 to go she put her head down and gutted out gold. After the race she immediately hugged Neal, who also attends Stanford. They appear often together on Manuel’s Instagram feed — in the weight room, poolside in sunglasses, flaunting bikinis and ripped abs, and in a series of “Fleek Films” videos featuring “two lit gurls” on the road to Rio. “Lia and I have this very special relationship. I wouldn’t be where I am right now without her,” Manuel said. Neal, 21, whose father is black and mother is Chinese-American, was born and raised in Brooklyn, New York, and speaks Mandarin. She said the constant questions about being a black swimmer can be difficult, “but I think that’s just what comes with the territory of making history. You’re going to be faced with the question a lot, because it’s so new,” she said before Manuel’s gold-medal race. Tallying up the previous black U.S. Olympic swimmers is interesting. The lineage begins in 2000, with Anthony Ervin, whose father is black and Native American and mother is Jewish. Ervin won silver in the 4×100 freestyle relay in 2000, and tied for gold in the 50 freestyle. After a long hiatus, Ervin returned to the 2012 Olympics in London and is now in Rio at age 35. Simone Manuel talks to Hannah Storm about how she started swimming and the pressure of being an Olympian. In 2004, Correia, also known by her married surname of McClendon, became the first woman of African descent to swim for the U.S. Olympic team. She was born in Puerto Rico to parents who immigrated from Guyana. In 2008, Jones won gold in the 4×100 freestyle relay, setting a world record of 3:08.24 on a team that included Michael Phelps. In 2012, Jones won silver in the 50 freestyle; silver in the 4×100 freestyle relay; and gold in the 4×100 medley relay. Neal picked up the baton in 2012, when she made the Olympic team at age 17 and won bronze in the 4×100 freestyle relay. She finished fourth at this year’s U.S. trials to qualify for the relay team in Rio. Neal swam her Rio relay leg in 53.63, just .10 seconds faster than her time in the 2012 Olympics, and significantly slower than she had been swimming this year. Not participating in the final was “devastating,” she said. “I was really upset after my race, just with myself. I was just like, why? I put so much more into these games than I did in 2012. Why didn’t it show?” Neal said. She was in a funk until two days later, when the swimmers in the preliminary round received their medals during an impromptu ceremony with the women’s team. Simone Manuel wanted to quit swimming because she “didn’t have anyone that looked like’ her in the sport but encouragement from her parents and coaches as well as her love of the swimming kept her going. Not to mention the black community, which made Simone Manuel a top trending topic on Twitter after her victory. “It means a lot, especially with what’s going on in the world today, some of the issues with police brutality,” Manuel said. “I think this [gold medal] will kind of help bring hope and change to some of the issues going on in the world.